She seems to twitch in whatever dream world her subconscious dropped her once the pain became too much and he briefly wonders what she is seeing. The fallen woman stirs at the press of his foot against her skin but does not rouse immediately. Pitch lips curl backwards over flat, but no less deadly, teeth. He lifts the same limb to prod her once more only to hear the rattling breath of words stuttering their way from between painted lips. He openly laughs, the sound mocking and contemptuous. She does not wish to die? ”Yet here you lay, on the filthy ground welcoming death with open arms.” It is fortunate for the wounded stranger that his abilities are smothered here, it is no difficult task for an angel of destruction to rip a soul asunder and fling it into the cosmos. He inhales slowly, savoring the scents of defeat and chaos and lifts his eyes to the heavens. Time holds no meaning for him and should he grow tire of aging, he will simply slip outside the cursed places that trap him with mortal strings. Ozereus knows that not all are blessed, or cursed, with his eternal spirit and he looks down at the bloodied woman again. He leans down, stretching his neck so that his lips are millimeters from her own and studies her a moment. Again, he inhales, but this time it is the perfume of ruby life he enjoys. Pinked tongue slips from onyx lips and swipes the droplets from her own. The flavor rolls across taste buds and the Fallen smiles. ”Do not fight me.” His voice is gruff, tone short and unyielding. His reasons for aiding her are his own and it would take a strength greater than the leagues of heaven to spill his secrets. Ozereus lowers himself to her level before sweeping an oversized wing across her back and pulling her closer. With careful maneuvering, he drags the woman across his back and uses his wings to anchor her there before unhurriedly standing. 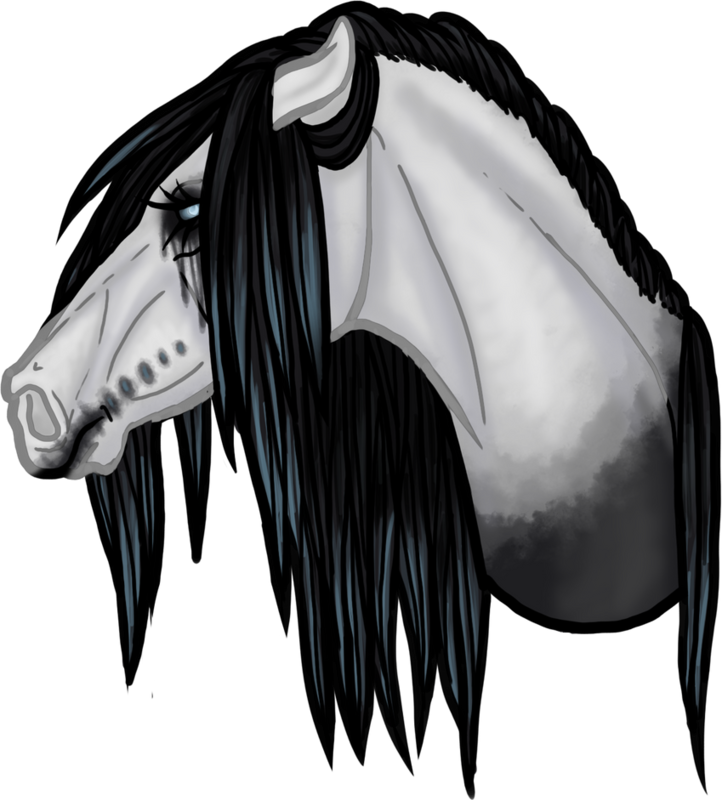 The nameless, rose-adorned creature now rests with a forelimb on each shoulder and her head lies against his neck; warm and weary breaths tickle the loose tendrils of shadowy mane. He shifts marginally to test the security of her positioning as he knows she will be unable to properly grip him with the broken leg. Their journey is painfully slow, and he is quite certain at various points she nearly succumbed to the lure of unconsciousness. He cannot help but wish for a place he did not miss until now, Elysium. There he could have taken the mortal directly to Arete for her healing gifts and simply continued with his plans for the day. A snarl escapes, the low rumble vibrating deep in his chest. No, here, he is forced to use outdated transportation and rely on nature to heal her at a turtle’s pace. If she heals at all. The likelihood of that is slim without proper care, abilities beyond his own. He walks straight through the night with her, dragging her when he feels her rear hooves give out in fatigued agony. The following dawn spreads golden red hues across the snowy terrain but silvered eyes do not take in the sight. Instead, he turns his gaze to a small pool of melted frost just outside of a cavern. Perfect. He draws in a deep breath to scent the area, pleased upon noting the absence of recent travelers. Ozereus steps to the edge of the pool before gingerly lowering himself to his knees and tilting his body to the right. The wing on that side catches the woman’s body and gently she rolls to the ground. ”You will need to rinse that.” He growls the phrase at her, irritated by lack of sleep among other reasons that he dismisses; namely the distinct absence of Arete in his life. The journey was a blur. Typically Maren’s twitching attention drew hyper-aware observations from her surroundings, or at least an understanding one didn’t expect from the deranged girl. But now? Ghostly visionaries didn’t flutter long black lashes open until finally she felt herself falling again. There was a moment where she thought she was finally slipping into the cold black waters of her hallucinations before finally her sight steadily configured. 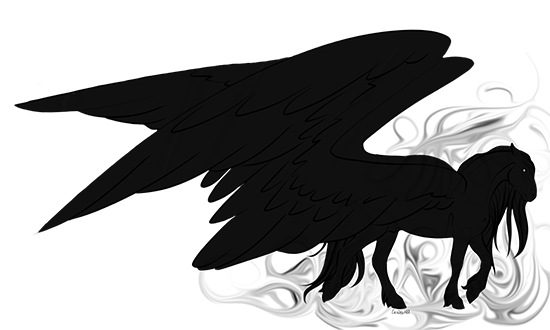 An obsidian silhouettes swam in spirals; some more transparent than others, but they continually swept over one another in a hazy image of a Pegasus stallion. His words are lost in the cotton fog in her ears, but they jerk and struggle to sweep towards the beckon. The Women Within’s voices steadily rise, echoing in the girl’s now empty mind. But vision, hearing, and an awakened, unseen company were not the only things returning to her. Not so steadily, but sharply, the pain in her leg amplified. Already a carnal mess of gore and flesh, the jostling journey (no matter how much care was taken) didn’t steady the hanging limb and it raged hot with harrowing pain. It flooded her immediately as clarity returned to her, and beneath the watchful eye of the obsidian Pegasus her body visibly tensed. Monochromatic skin trembled across her form as a hiss escalated into a deep, guttural growl. The daughter of the Iron Rose drew away from her own injured limb, even if it was simply recoiling upon herself, with labored breaths that escalated in depth with each passing circulation. But sharp words snap the deranged’s attention finally towards the stranger that saved her, despite not necessarily comprehending the fact. For a moment the tension in her body builds, continually coiling as eerie eyes of saturated teal bare at him betwixt khol tearstains. A nearly indiscernible quiver shakes her visage, hanging like a snake over her injured limb to protect it. She hangs there, hunched over herself while white hot pain boils her with fever. Eventually that boil overflowed, and the girl who wasn’t beget of a god nor ever a princess like her sisters hopped up onto her good fore knee and extended her nimble neck as much as it could. Just as charcoal lips ripped back along her midnight fangs (curved and thick and eager to sink into flesh) pain crippled her. A scream rips through her lips and she topples forward with the momentum she’d built. The melted pool slapped the side of her face as if a disappointed mother, cold and unrelenting. The stimulus overload spurred the sputtering, tortured howls as her scream faded and she rose her visage from the pool. The crystalline drops slipped along her bleached visage, mixing with the crusted blood so that the dried sanguine returned to staining her alabaster mask. Dramatically fading, the yowls transformed into whimpers as she pulled the injured leg towards the pool. It skipped and drug along the ground like an abandoned doll’s appendage, and each and every minute movement seemed to flare through every nerve ending across her body. Hot breath rolled in columns of steam from her nostrils, plumes of teal rising and intermingling with the heat of her lungs, as she stared at the mangled limb. She couldn’t hunt with an injured leg. Without warning her eerie gaze, not her visage but only her eyes, snapped back up to the Pegasus she had just attempted to bite. Why was she here, and more importantly, what was he doing by bringing her here? He watches in curious silence the way she rouses and begins to shift. Having broken many limbs in his extensive lifetime, he is no stranger to the folly that befalls those who attempt to stand upon a fractured bone. Her shriek resonates, echoing in ear drums and he automatically snarls at the foolish woman. ”Hold your tongue, banshee.” Only the dimwitted dare broadcast their location in such a way. It is with disgust curling an inked upper lip that he contemplates using a feathered limb to forcefully push that stained mask under the water until her pathetic sounds cease forever. He did not miss the way she attempted to sink fangs into dark flesh, but the absence of contact leaves him only agitated. ”Why did I save you, again?” The words are murmured, not to hide them from her (if she can hear over that awful noise she makes) but a mindless utterance at his own foolishness. He now steps back toward her, malice glimmering in silvered depths, to lower his gaze to the flowered wolf. Rusted chords flay the air while a pitch wing hovers above the crown of her head, ”What is your name?” He will not ask a third time, feral shadows gather in the corners of swirling eyes and muscle turns to stone. The Fallen dances with a dangerous line, a smirk twisting inked lips to reveal pale ivories devoid of fang. He does not need over-sharp canines to rend flesh from bone...no, he is proficient in the art of the kill without those primitive tools. Backing away he circles to stand in the chilled pool, bestowing a single harsh look of warning to the rose-strewn banshee. Silence. Darkening eyes demand of her, before a mass of feathers launches a cascade of water at the bloodied mess of a limb. Satisfied that debris and dust from their journey are at least gone, Ozereus steps over the diminutive woman leaving tail and wings to smack against any part of her flesh left in his path. He returns to that cavern wall, icy torrents of liquid cascade down to mix with cooling earth. Shadows still crowd the outer corners of silvered eyes, the urge to remove the weakness riding him like thirst drives the lost in a desert. He does not understand what holds the beast back when she should be a mangled heap of onyx and fair meat in a river of crimson, but neither does he step into the feral’s toothy embrace. The Fallen stares at her, annoyance and amusement spread in equal parts across pitch features while he contemplates next steps. There was an undeniable malice that radiated from his shadowed embodiment. It was the kind of aura she had expected to feel from her family in all her years – one she was sure was hidden beneath the surface of disgruntled tolerance. It struck a semblance of fear in the girl, but she was not one to listen to the prickles of goose flesh as it screamed of terror. Rather, she ignored just mental transmissions. Rather her own depthless eyes of dusty periwinkle bore back at the winged savior, staring not without challenge into the abyssal, mesmerizing pools of silver that burned back at her. Her visionaries spoke of temptations: dared him to get closer, promised him that her fangs wouldn’t miss again. She’d be more careful, afterall. The disconcerting quiet of her mind’s eye ceased with the cautious, fiery whispers of the Women Within. They drew her away from the male with their familiarity, coiled her back into herself while the fallen inched over her and hung menacingly with the threat of drowning. Perhaps he would mistake this recoil for fear of him or mayhap he’d have the clarity to see just who rotted her brain was (“Never rotted, just unique.”). He hissed a command and her attention responded with a snap – gaze and attention reverted back to him. Her visage twitched, twisting upon her neck as if she were some sort of lock and her head the key. Khol kissed lips pulled back with an expulsion of her teal brume; another primitive threat. Knock her down, but she won’t stop fighting. Does any injured animal? “Your name, Maren.” “Tell him your name.” “Do you want him to kill us?” “Tell him your name! The young hedge witch steeled her lips as he prowled around her, a massive creature in comparison to her far more petite and lithe frame. Again her twitching visage only spoke of defiance, of distrust as he stood at the precipice of the pool. (“Can you trust anyone, Maren?” “What is he doing?”) Her body trembled with the desire to shift, to sit up to the extent she was able, but also with pain. She knew she couldn’t move less she provoke the suffocating agony. So she shook there beneath his shadow until his wings unfurled. Instinctively her lids clasped shut as the burst of air assaulted her eyes, but it was the sting of the water cresting her mangled extremity that ushered a hiss through her tightly drawn lips. Her eyes don’t reopen as he steps over her – she can feel the ground quiver beneath the weight of his strides, the slick threads as they slip over her face, and the surprisingly sharp edges of the feathers as they draw clean lines. Rather her labored breaths come quickly, lungs rasped. She lingers there, as if some sort of catatonic beast awaiting nightfall to emerge, until finally slivers of dusty blue peek through blackened tear stains. “Maren.” She growled. "maren talking", "women within", "wolf within"